Air conditioning for an office is an essential as it keeps the environment at the perfect temperature for a comfortable and productive work environment. At Pure Office Solutions we are air conditioning specialists and provide office air con planning as well as office air con installation. We provide you with the ideal temperature for you and your staff to work in. We can offer you a range of different air conditioning units for all room types and sizes such as Mitsubishi air conditioner and Deikin air conditioners. Unlike other products air con units have features that work as an electric heater and also control the humidity making it a great versatile option that can be used all year round. Commercial air conditioning units not only control the temperature inside a building but also movement, humidity, cleanliness and ventilation, providing year-round climate control for a comfortable and productive working environment. 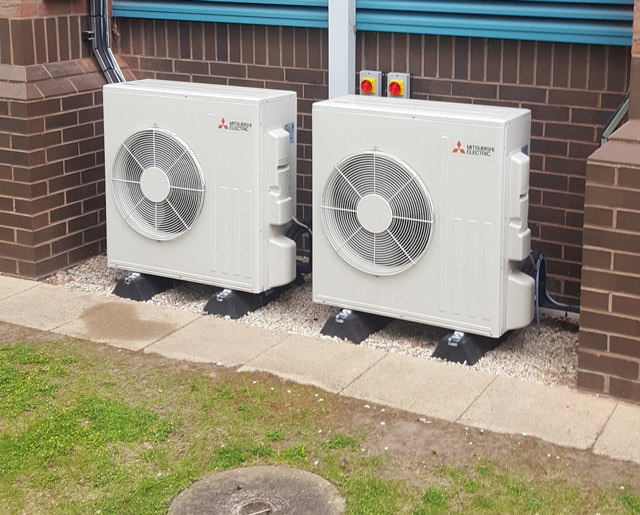 At Pure Office Solutions, we provide Deikin and Mitsubishi air conditioning / heat pump, energy efficient climate control, VRV (VRF) systems for the office and industrial market from design and installation through to maintainer and repair. We only work with world-leading suppliers of energy efficient air conditioning equipment that will cool, heat, ventilate and control your buildings. Whatever your requirement or application, we have the right solution for you, that really can make a world of difference. Our hands-on relationships with our clients mean that we really do understand what different buildings and workspaces require. Trust us to come up with the air-conditioning system that is right for you, every time.